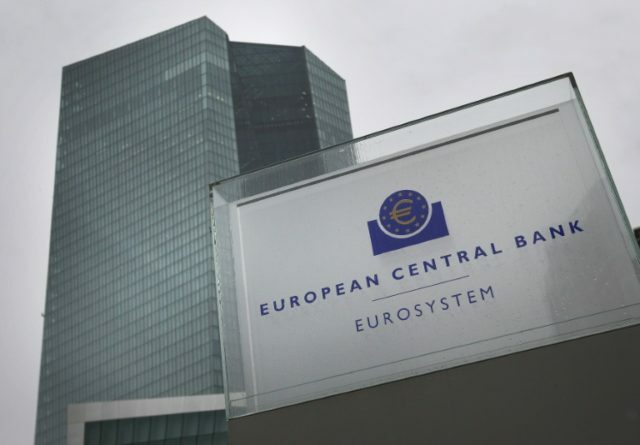 Frankfurt am Main (AFP) – The European Central Bank on Thursday signalled greater confidence in the eurozone economy and its own chances of hitting its elusive inflation goal by dropping talk of boosting its mass bond-buying programme. The latest monetary policy statement from the bank’s governing council no longer mentioned that policymakers stood ready to increase their 30-billion-euro ($37.1 billion) per month asset-purchasing programme “in terms of size or duration” should the global outlook become less favourable. The phrase had been included in every communique since December 2016. The euro jumped immediately after the ECB statement was released, to $1.242 from from $1.237 before. “The change is arguably the ECB’s first cautious step along a path of gradual policy normalisation, which explains the immediate rise in the euro,” said analyst Jennifer McKeown at Capital Economics. As expected, the statement confirmed that the bank will continue to buy 30 billion euros ($37.2 billion) of government and corporate bonds per month until September at least. Also in line with expectations, the ECB left key interest rates unchanged. The main refinancing rate remains at zero percent, the rate on the marginal lending facility at 0.25 percent and on deposits at -0.4 percent, meaning banks pay to park money with the ECB. The wording of the six-weekly communique is closely scrutinised by ECB watchers eager for a clue on how and when then bank might end its multi-trillion-euro stimulus programme. Along with historic low interest rates, the bond-buying programme is designed to stoke economic growth by pumping cash through the financial system, helping boost inflation to the ECB’s target of just under 2.0 percent. Although expansion has surged in the eurozone, reaching 2.3 percent last year, inflation has failed to rise in step, falling to just 1.2 percent in January. Attention now turns to ECB chief Mario Draghi’s press conference at 2:30 pm (1330 GMT), where investors will be looking for reassurance about growing political risks on the horizon. US President Donald Trump raised the spectre of a transatlantic trade last week when he vowed to slap steep tariffs on steel and aluminium imports, prompting the European Union to threaten retaliation. “Trade wars are bad and easy to lose,” EU President Donald Tusk said on Wednesday, directly rebuffing Trump’s assertion last week that they were “good and easy to win”. Meanwhile, Sunday’s elections in Italy produced an unclear result that will make forming a government for the eurozone’s third-largest, debt-laden economy difficult. After days of turbulence on global financial markets, observers expect Draghi will be keen not to spook investors with any talk of heading for the stimulus exit. Draghi will also unveil the ECB’s latest growth and inflation forecasts which are expected to show an upbeat outlook for the 19-nation single currency area — although the figures would have been drawn up before the threat of a trade war erupted and ahead of the Italian polls result.